The son of a book illuminator, Ambrose was born disfigured and he was given to the care of a nurse. The nurse found that the only time the child was peaceful was in the local church. Ambrose grew up within the security of the church, praying day and night. He was generous, working with the poor, the abandoned, and the sick. 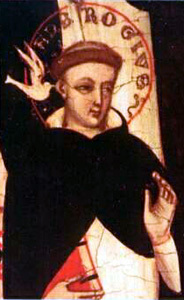 Ambrose joined the Dominicans in Siena, Italy on his 17th birthday. He studied in Paris and Cologne with Saint Thomas Aquinas. He worked on diplomatic missions for popes and rulers, evangelized in Germany, France and Italy. Patron of engaged couples and of the city of Siena.